PRG-DX grinders are highly productive by design. The wheelhead only needs to travel half of the rotary table diameter for full contact grinding. It’s ideal for single or multiple workpiece grinding. They’re perfect for high production precision work. Rigid heavy Meehanite cast construction. Superb Accuracy. 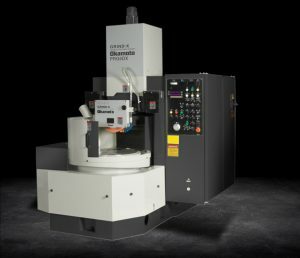 Powerful 10hp grinding spindle motor stands up to continuous production grinding. No table overhang assures optimum accuracy. Ergonomically designed for optimum operator convenience. Versatile table swivel +/-5 degrees.